Inscribed with color notations throughout in red chalk. 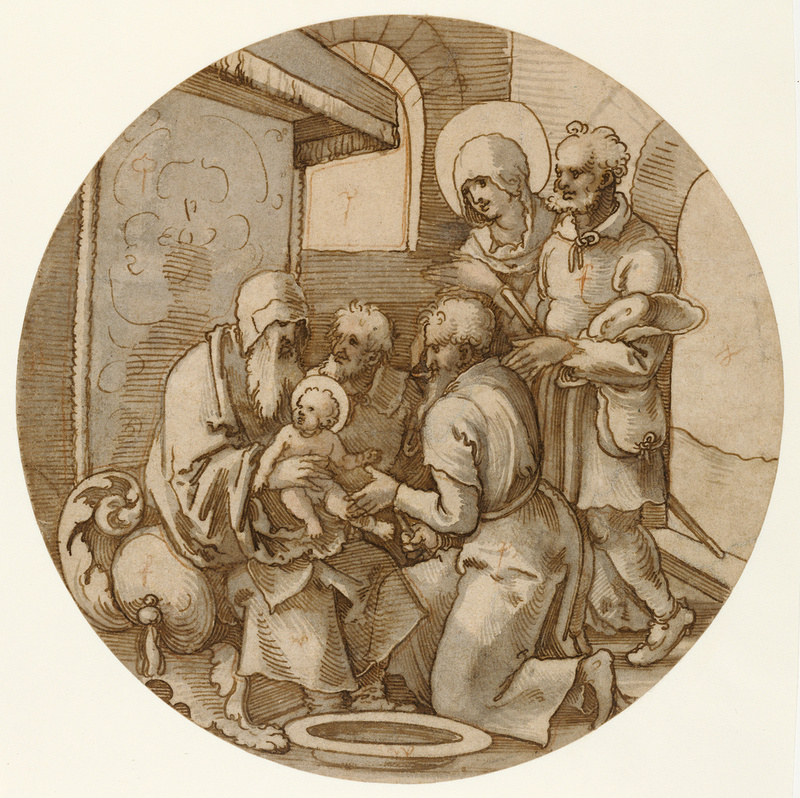 The Virgin Mary and Joseph watch with clasped hands as a priest prepares to circumcise their son, the infant Jesus. The drawing's simplified linear style appropriately renders their air of homespun piety. Sebald Beham relied upon simple, bold outlines and hatching to describe the scene, since few details would be visible once the scene was set high in a church window. During the 1520s, Beham and his workshop produced many designs for stained-glass windows. This highly finished sketch was part of a series of more than twenty-five works made for a group of windows showing scenes from the lives of the Virgin and Christ. The drawing functioned as a cartoon for a specialist stained-glass maker, who then cut and painted the glass in shapes and colors according to the design. The color notations and red chalk lines inscribed throughout the drawing indicate the placement of glass sections and leading. The lead was then soldered and cemented around the glass pieces before the panels were secured to the window's iron cross-bars.